PlayerUnknown’s Battlegrounds’ latest patch gives the meditative survival shooter a big, welcome change of pace. Battlegrounds’ blue circle, which progressively makes the playable area smaller, got tweaks to its speed and damage. Now, players who survive longer in Battlegrounds’ death blender will face more interesting survival conditions as they pursue the number one spot. Battlegrounds features a blue circle that constricts through the course of the game. Anybody who’s outside that circle for too long slowly bleeds out and dies. Previously, Battlegrounds’ blue zone constricted rapidly in the game’s middle and later phases. In the beginning of a match, players could just meander over to where they needed to be before getting unceremoniously headshotted. A graph from PlayerUnknown’s Battlegrounds detailing the new changes. Today’s update changes the game’s pace. The blue zone closes in rapidly in the game’s first few minutes, meaning that more players might get stuck outside it earlier on. That’s a good thing, in my opinion: It means players won’t get as invested in games they’re unlikely to do well in. If they can’t make it to the playable area in time, and there aren’t vehicles nearby, sayonara! Later on in the game, the blue zone moves slower and does more damage. That ups the tension in Battlegrounds’ already-tense last few phases. In the half-dozen games I played today, I noticed that Battlegrounds’ pacifist strategy—where players hide in some far-flung bathroom until everyone else dies—is a lot less viable now. Early on, the blue circle forces players together. That means leaving the bathroom and looking for another safehouse while out in the open and vulnerable. 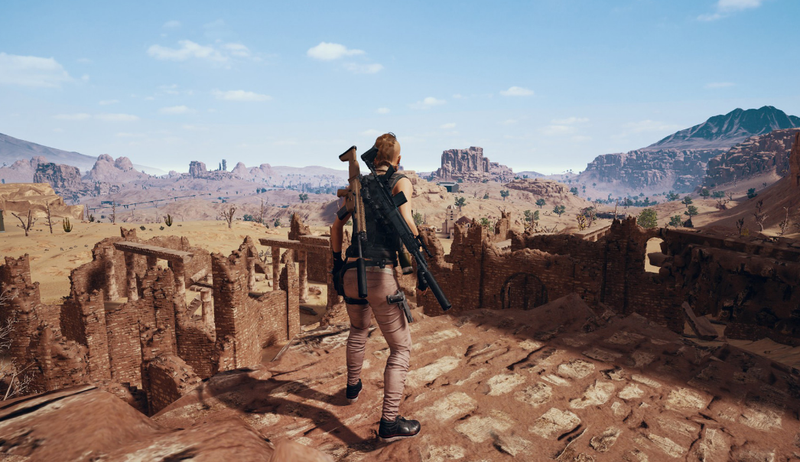 For players far outside the playable area, it also means searching frantically for a motorcycle or a car as soon as possible. As the circle’s speed decreases in the late game, the hiding strategy becomes more viable—only when it counts. On the flip side, surviving among the top 10 players feels a lot different. I’m not sneaky, and I don’t have pinpoint shooting accuracy. But since the blue zone constricts more slowly in those phases, I could be a little more tactical about my next move (i.e. prepare to move from one safe bathroom to another safe bathroom). Without having to act as quickly, I could plan more, which lead to more tense, who-will-make-the-first-move standoffs instead of a battle of brute shooting skill. However, if you get stuck outside the blue zone in those last few moments, you don’t have a lot of time to stay alive. Once, when my duos team was #4, I got stuck on a rock while my teammate sprinted to safety. It only took a few short seconds for the life to drain out of me. Since some of Battlegrounds’ environment isn’t traversable, it sucked to die like that when I’d done a lot of work to stay alive. That said, it’s easier to savor the delicious last few moments of a Battlegrounds game now, since they can last just a little longer. Just don’t be a dummy.